So you want to get back the Start Menu on your Windows 8. Here are some of the best Start Menu software that can add the Start Menu on Windows 8 just like Win 7 or much better than that. If you have a Windows 8 computer than you will be familiar that their is no Start Button on Windows 8 and when you move your mouse to bottom left corner and click on it a new screen appears which is the replacement of the old Start Menu. Every time when you need to open your software from the Start, you will have to place your mouse cursor on bottom left corner or top right corner and than click on the start button to go to the Start Screen. It gives you full metro screen and styles and can be customized easily, but in the customization options too, you can't use your own wallpaper as Start Screen desktop background and their is a limit of colors usage in the start screen (you can use only colors that Microsoft wants you to use on Windows 8). In this post I will tell you how to add the Start Menu back into Windows 8 in a very easy way. 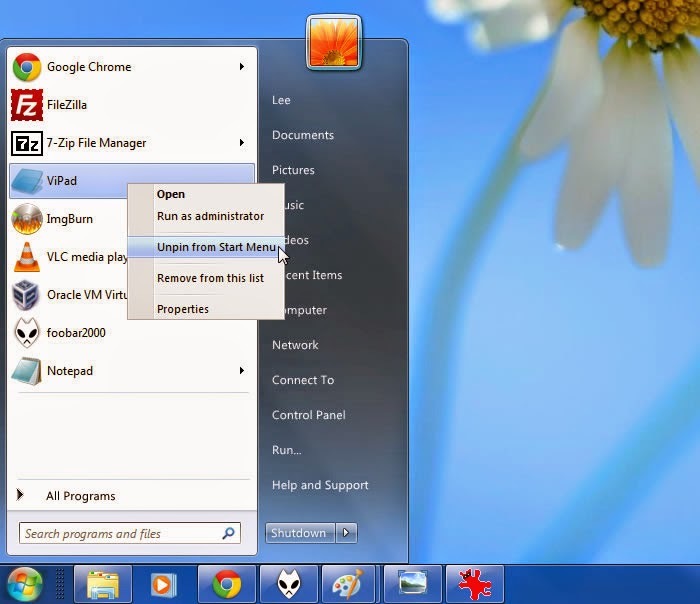 To make the Start Menu appear just like Windows 7 you can use third parties softwares like ViStart 8, Classic Shell etc. I will tell you about all the best free and premium Start Menu creator for Windows 8. Microsoft have tried best to make the user to use the new Start Menu in Windows 8. Although, they are bringing the Start Button back in the update of Windows 8.1 but when you will click on the start button you will be taken to the same metro style start screen. If you're just fine with the new start screen and you just want to add the start button on your Windows 8 than you can update it to the Windows 8.1, the update will bring back the start button and you will be able to change the background of the Start Screen with your custom wallpaper but the colors will be limited. You can read the post on Adding Custom Background Image on Windows 8 if you don't want to upgrade your OS to 8.1. But if you want to get back the start button along with start menu than read the steps given below. You can use many software to get the start menu back into Windows 8. Here is the list of some the best Start Menu programs for Windows 8. It's a great free utility to get the start menu back into Windows 8. 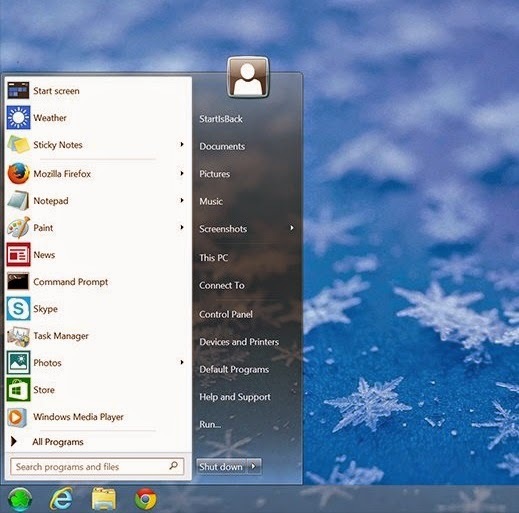 You will get the Start Menu which almost identical to the Windows 7. It also offers to theme designers to customize the Vi Start completely and they can customize all the elements of the Start Menu easily. It's search programs looks quite good and you can search for all the programs and files too. You can change the skin of the start menu, Now take a look at the Screenshot of the Start Menu in the image given below. Go to this link to download this Software. Just like ViStart, classic shell is also a very good free alternative that can bring the Start Menu back into Windows 8 and 8.1. This software is also customizable and you will get multiple styles and skin with this program. You can download the Classic Shell for Windows 8 from here. 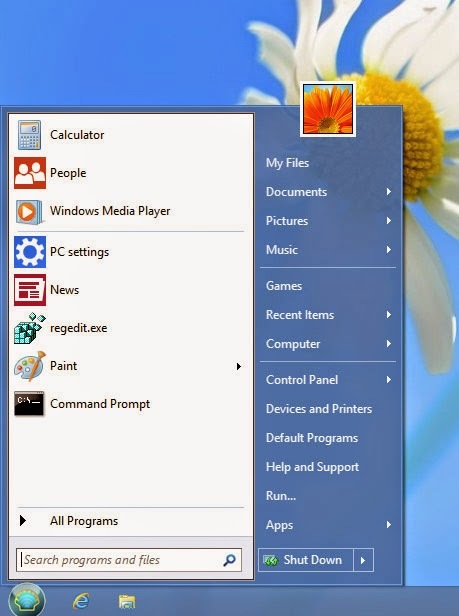 All the Start Menu programs on this post tries to replicate Windows 7 like Start Menu on Windows 8 and with the feel of Windows 8, this application is completely different from others. When I use this software on my Windows 8 computer I really liked it and the design is also awesome. Their is also a function to add widgets start menu such as Facebook to see their status updates directly on the menu. You can Pin and organize it on your Start Menu with Pokki. If you're looking for a Start Menu software but not with the Windows 7 design and feel than you should give it a try and I am sure you'll like it. If you want to buy a Start Menu software than see the Start8 below. Take a look at the screenshot of Pokki Start Menu below. But if you can afford a little than I will suggest you to go with Start8 created by Stardock. You will have to pay a small price of $4.99 to get this Start Menu software and to test if it works good you can download version for free for 1 month. With this software you will get all the features of Start Menu back into Windows 8 and their is also an option to use the Start Screen instead, you can choose the start screen to appear along with the taskbar or just like the Windows 8 Start Screen but with start button. Like all the above software it will boot directly into the desktop without causing start-up problem. You can choose form large number of start buttons. To download the software go here. Take a look at the screenshot below. If you're looking for a Start menu that will kook exactly like the Windows 7 Start Menu than you can buy Start is Back Software. It will just contain the same start menu orb button as in Windows 7 and every feature that Windows 7 start button and it is customizable too. You will also get some Windows 8 features with this Start menu Software for Windows 8. You can download StartIsBack from here. Late April, Microsoft revealed that Start Menu is returning to the second update of Windows 8 and it seems that the update can come in August. That's It! 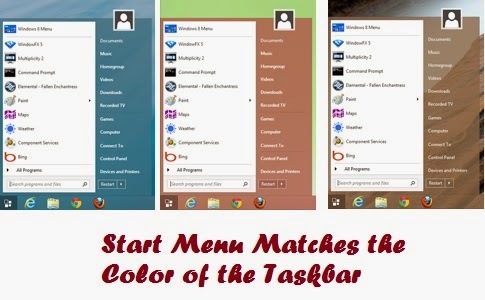 Enjoy these cool Start Menu on your Windows 8 PC.